Energy Efficiency technology companies raised $211 million in VC funding in 14 deals this quarter compared to the $185 million in 17 deals in Q4 2015 and $140 million in 15 deals in Q1 2015. 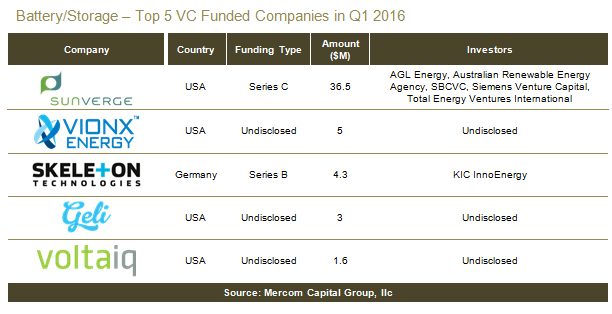 Mercom Capital Group, llc, a global clean energy communications and consulting firm, released its report on funding and mergers and acquisitions (M&A) activity for the Smart Grid, Battery/Storage and Energy Efficiency sectors for the first quarter of 2016. 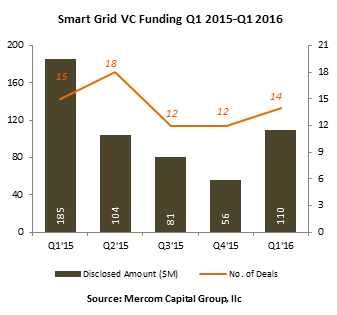 Venture capital (VC) funding (including private equity and corporate venture capital) for Smart Grid companies increased twofold this quarter with $110 million in 14 deals, compared to $56 million in 12 deals in Q4 2015. Year-over- year (YoY), funding was down compared to Q1 2015 when the sector raised $185 million in 15 deals. 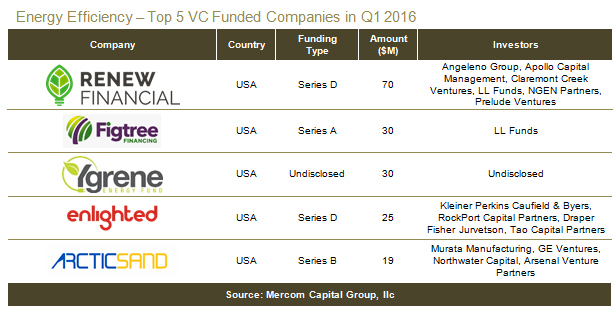 The top VC funded Smart Grid companies included mPrest, which raised $20 million from GE Ventures and OurCrowd; Powerhive which raised $20 million from Prelude Ventures, Caterpillar Ventures, Total Energy Ventures, Tao Capital Partners, Pi Investments and other investors; Smart Wires, which also joined the $20 million club; Telensa, which brought in $18 million, including equity funding from the Environmental Technologies Fund and debt funding from Silicon Valley Bank; and Evatran, which raised $10 million from Zhejiang VIE Science and Technology Company. 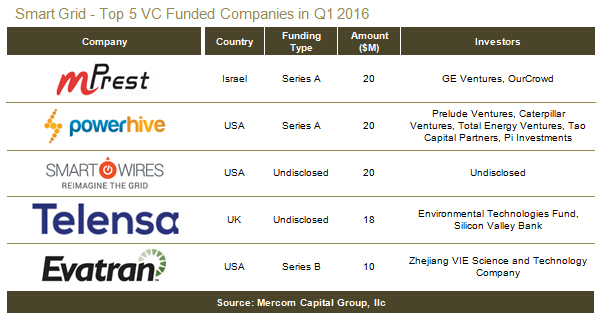 Twenty-two investors participated in Smart Grid VC funding rounds this quarter, with Smart Grid Communication companies raising the most. There were two debt and public market financing deals announced by Smart Grid companies this quarter, totaling $214 million, compared to $3.5 million in one deal in Q4 2015. There were two Smart Grid M&A transactions in Q1 2016 compared to nine transactions in Q4 2015 and seven transactions in Q1 2015. VC funding for Battery/Storage companies dropped 50 percent with $54 million in 10 deals this quarter, compared to $108 million in eight deals in Q4 2015. Year-over-year funding was lower compared to the $69 million in seven deals in Q1 2015. The top VC funded Battery/Storage company this quarter was Sunverge Energy, which raised $36.5 million from AGL Energy, the Australian Renewable Energy Agency, SB China Capital, Siemens Venture Capital and Total Energy Ventures International. VionX Energy raised $5 million, Skeleton Technologies brought in $4.3 million from KIC InnoEnergy, Geli raised $3 million, and Voltaiq raised $1.6 million. Eight investors participated in Battery and Storage funding this quarter, with Energy Storage System companies raising the most. There were two debt and public market financing deals in Battery/Storage this quarter totaling $29 million compared to $32 million in three deals in Q4 2015. Green Charge Networks raised $20 million for non-recourse project financing for energy storage systems. There were two M&A transactions involving Battery/Storage companies in Q1 2016. In Q4 2015, there were two M&A transactions, and in a YoY comparison, there were five transactions in Q1 2015. The Top 5 Efficiency deals included the $70 million raised by Renew Financial from Angeleno Group, Apollo Capital Management, Claremont Creek Ventures, LL Funds, NGEN Partners and Prelude Ventures; the $30 million raised by Figtree Financing from LL Funds; the $30 million raised by Ygrene Energy Fund; the $25 million raised by Enlighted from Kleiner Perkins Caufield & Byers, RockPort Capital Partners, Draper Fisher Jurvetson and Tao Capital Partners; and Arctic Sand Technologies raised $19 million from Murata Manufacturing Company, GE Ventures, Northwater Capital and Arsenal Venture Partners. Thirty-one investors participated in VC funding this quarter with LL Funds participating in two deals. Within the sector, Efficiency Finance companies brought in the most funding. Two Efficiency companies brought in $238 million in debt and public market financing this quarter compared to $216 million in two deals in Q4 2015. Renovate America announced its second green bond and sixth overall securitization of PACE bonds of $217.5 million. There were three M&A transactions in the Efficiency sector this quarter compared to 10 in Q4 2015. All three of the M&A transactions this quarter involved lighting companies.